The experts agree that writing a magnetic resume is no easy task. So, how do you make yours stand out among the sea of other documents? You don't need to labor excessively to create a resume that meets the requirements of hiring managers. Rather, getting a few tricks under your belt can make your document a shining star in a competitive market. Our free online resume templates are sleek and organized to make your information attention-grabbing. We have a large collection of designs for every industry to suit your needs. Our platform is specially created to take the headache out of formatting and writing. If you're interested in making the most of your time and customizing a great resume fast, learn how to kickstart your professional journey. 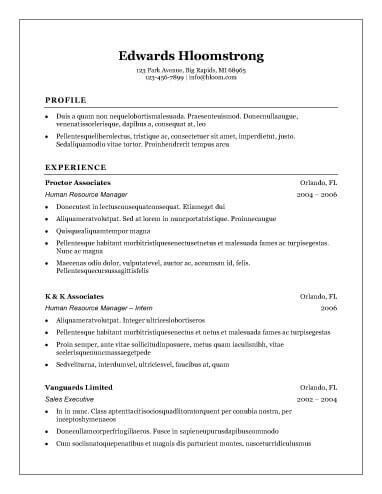 Why Use Free Online Resume Templates? There are many companies that offer resume writing services without knowing anything about you or your job history. The truth is that nobody knows your professional aspirations better than you! Our free online resume templates make expressing your potential easy. You fill out each essential section of your document step-by-step while having access to industry-specific phrasing and keyword suggestions. With these tools at your disposal, writing a resume can be a learning experience to master the expectations and etiquette of your field. Instead of feeling lost in the dark, you can feel empowered as the call-backs start rolling in. It's the most convenient and fastest way to stay ahead of other applicants. Experts generally don't suggest using humor in your resume as a tactic to get an interview. That doesn't mean you can have fun if you're making your debut in a creative field such as graphic design, advertising, or photography. Our creative free online resume templates help you express a passion for your field and impress the people who matter. Many recruiters want to see a resume that's conservative and well-organized. Our tried and true free online resume templates have been working for jobseekers for decades. They continue to be a requirement for most industries. Fonts, margins, and spacing come together in an uncluttered document that contains all your essential skills in a format that's sophisticated and classic. You might be a newbie, but you're prepared. Land a fantastic job by using our entry-level free online resume templates to frame your accomplishments and qualifications in the best way. Check out our library to learn how to make filling a page with relevant details less intimidating. Templates feature an economical use of white space to eliminate fluff if you have limited experience. The truth is in the details. Our professional free online resume templates come in a variety of styles, from traditional and streamlined to creative and colorful. No matter which format you use, you can be sure your unique work history and skills will pop off the page. Strong fonts and a flash of color distinguish your document while remaining appropriate for traditional companies. Finance, law, and medical professions call for a streamlined resume with little distractions. Our basic and simple online resume templates cut right to the chase, eschewing imagery and wacky column placements in favor of an easily scannable layout. We offer 30 designs suitable for all stages of a career, including entry level, managerial, and executive. Unless you're applying for a position that requires at least 10 years of experience, your resume shouldn't be longer than one page. Thus, every word counts toward making a great impression. Browse our free online resume templates by industry to find one that applies to your situation. You'll find a plethora of keyword and phrase suggestions our editors compiled specifically for your type of job. Also, check out our writing tips that guide you through every section of your document. It's filled with valuable hints to make your information noticeable in a single glance. Whether you desire an accounting or graphic design position, there are tools of the trade you must know if you want your resume to remain on a manager's desk rather than go right into a trash can. Name: Use your full name. One good way to get noticed is to make the font size slightly larger than the rest of the text. Phone Number: Display a home or cell number you use frequently, and make sure your voicemail message sounds professional. Mailing Address: It's becoming outdated to use your full address. If you wish, you may note your city and state if you want an employer to know you're local. If you want to relocate for a position, an out-of-state address might be a red flag. Summary: This is a short pitch explaining your best professional skills and experiences to recruiters. It should be three or four sentences or bullet points and jampacked with relevant details intended to make a recruiter want to read more. Objective: An objective statement expresses why you want the job rather than what you can offer the company. Unless you're an entry-level candidate or looking to change industries, write a summary statement instead. Scan: Read the job description closely to identify key skills the manager wants you to have. List them exactly as they're written. Brainstorm: Think of hard and soft skills you possess. Compile: Limit your list between six and eight skills to make room for other sections. Positions: Think of at least two, but preferably three, prior jobs that relate to your industry. Add the name of the employer, your official title, and the month and year you worked. Bullet Points: To spice up your language, begin each bullet point with a strong action verb. For example, "led a team of 20 employees" sounds better than "hired to oversee employees." Accreditations: Add universities or colleges you attended and the official name of your degrees, certifications, awards, and memberships. As you fill in your information step-by-step, our writing tips help you eloquently and professionally state your attributes. All the technical aspects are instantly adjusted for a document that's visually stunning and impeccably formatted. It's the best way to boost your confidence in a competitive market. It's no wonder that our services have helped people get a job 33% faster than jobseekers attempting to do it alone. Join our ranks of successful professionals by signing up today!